The accreditation process from application to pass production for a major event, provides stakeholders, attendees, media and guests a first impression of the professionalism and conduct of the event and its organisers. Determine access privilege through venues and secure areas. There are various levels of accreditation, in accordance with the security requirements of the event. This can include invitation only attendance for VIP’s, photo identification credentials, international delegation management and incorporation of technology such as RFID or NFC. The accreditation system needs to be a robust and highly secure platform to obtain, manage and disseminate critical attendee details to various stakeholders. Depending on the level of security required onsite, different zones can be set up which align with attendee credentials and pre-approved access, restricting or granting them access to these zones. Zones can include access for specific categories of attendees including government ministers and officials, media, volunteers, staff etc. The zones can be managed from a low-risk scale of visual identification of credentials to match the attendee, to high-risk scale with RFID embedded credentials and gateways at entry to all zones. Credentials, or commonly known as name badges, are produced according to the security requirements of the event. At a minimum, accreditation credentials are typically full colour A6 size badges (with branded lanyards) containing key demographic details in easy-to-read formats, from a distance and during day and night. They are durable material of waterproof stock and can include photo identification, QR or barcodes, RFID chip embedded plastic cards and holograms. Credential production can be one of the most time consuming aspects of the accreditation process and can begin months in advance of the event. 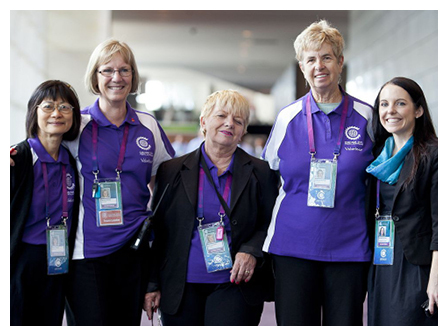 We managed and produced over 40,000 accreditation passes for CHOGM 2013 and over 15,000 for CHOMG 2011. Do you have more questions on using accreditation for events? Get in touch with us to find out about our accreditation services.